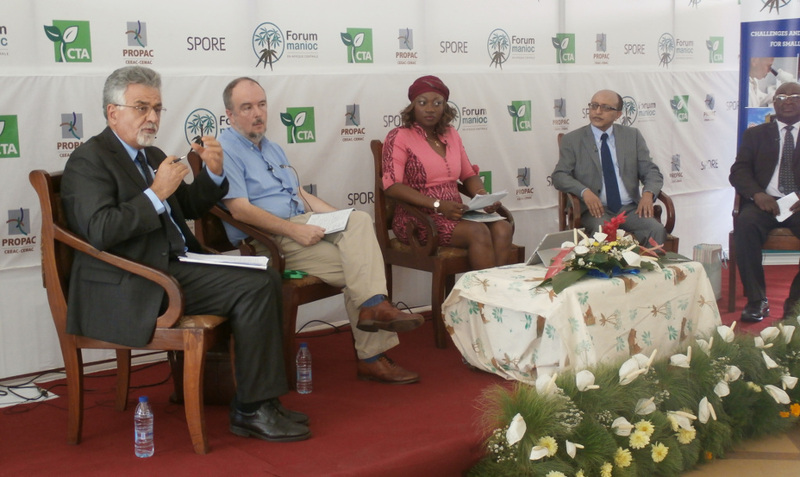 IITA was very active and visible at the cassava regional forum in Yaoundé held from 6 to 9 December. The event was organized by the Technical Centre for Agricultural and Rural Cooperation (CTA) and PROPAC with support from various organizations including IITA. The main objective of this forum was to bring together actors of the cassava value chain from Central Africa in order to develop, using a participatory approach, a common agenda for the region that will address major challenges and identify opportunities in the sector. Hanna (Left) speaks about the challenges and opportunities offered by IITA for cassava farmers in central Africa. On the first day, IITA hosted participants for a field visit on the campus. Rachid Hanna, IITA-Cameroon Country Representative, welcomed the visitors and offered a guided tour of the experimental farm and the various laboratories. A mini food fair was organized at the end of the visit with cassava-based preparations, including the famous tidbits, which was highly appreciated. The Chad delegation and farmers’ associations were impressed by the cassava manual chipper which IITA-Cameroon had developed and distributed through the IFAD supported PNDRT project. Throughout the event, IITA manned a stand where we interacted with visitors and exhibited various posters and documents on ongoing cassava research as well as some cassava food products. In addition to various cassava publications that were exhibited, yellow root cassava was a major attraction to hundreds of visitors of the IITA stand. After tasting boiled yellow-root cassava (TMS07/0593), several officials asked that IITA should start promoting yellow root cassava for school lunches. During the conference proceedings, Hanna participated in a panel broadcast live on the national television channel, CRTV, on the challenges and opportunities for cassava smallholders in Central Africa. Hanna and Apollin Fotso also held a mini-conference on cassava pest and disease management and cassava variety identification. Following the presentations and discussions, participants prioritized actions needed in their respective countries on cassava pests and diseases and variety dissemination and identification.